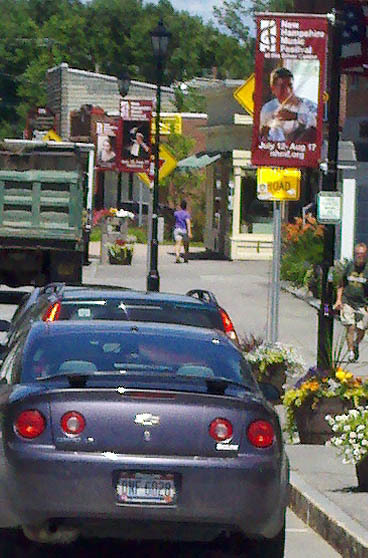 Our town celebrates the summer with the arrival of the New Hampshire Music Festival. This year we made them a set of lamp post banners featuring pictures of the conductor and soloists that will be featured in the upcoming concerts. Not only are the lamp post banners great publicity for the Festival, but they welcomed the musicians to town as they started to arrive over the weekend. We installed 10 lamp post banners in a little over two hours. We’ve made thousands of them, but these were the first ones I’ve ever had to install. They go up pretty fast, and I’m very pleased with the presentation. This entry was posted in large format printing and tagged boulevard banners, event banners, outdoor banners. Bookmark the permalink. Sometimes, banners like these though covered with ads and announcements, could act as decoration in the streets reminding the public that there is a big event coming or that will be held in their community.